All eyes are on FIFA World Cup host nation Brazil—but all accounts tell a story plagued by unfinished stadiums, increasing national unrest and progressively worsening protests. 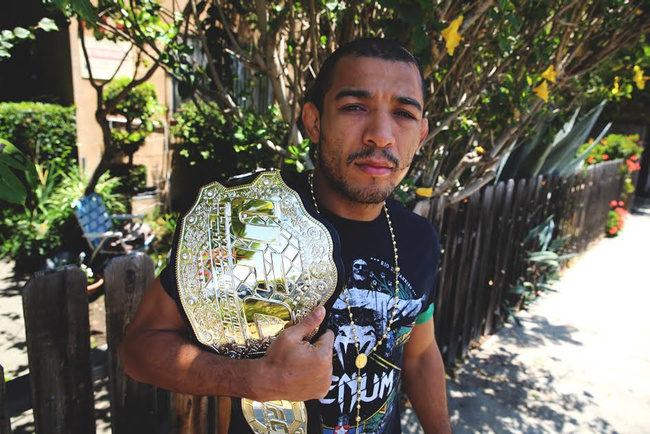 On day one of the highly anticipated tournament, we asked featherweight champion of the world Jose Aldo, a Manaus native, what he thought about the situation. What he told us surprised us, after hearing all of the horror stories. He paints us a much more positive picture complete with colorful streets and proud citizens. I sat with Aldo to see what he had to say about Manaus—the gem of the cup and his hometown—national pride, his predictions of a victor (Brazil, of course), and what will happen if Brazil doesn’t win. 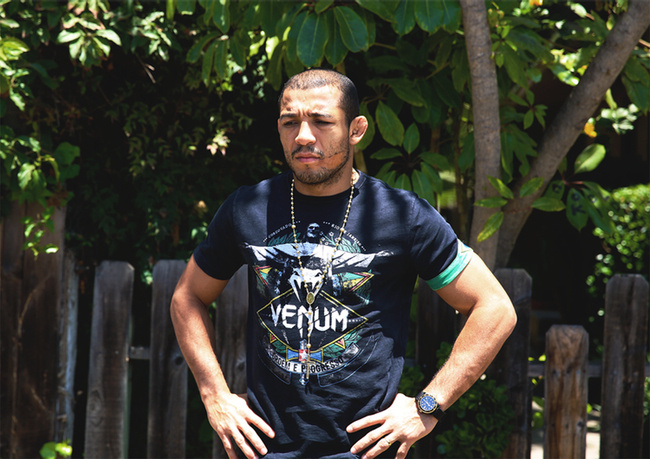 Fightland: You’re from Manaus, in the state of Amazonas. What are people there saying about hosting the World Cup? 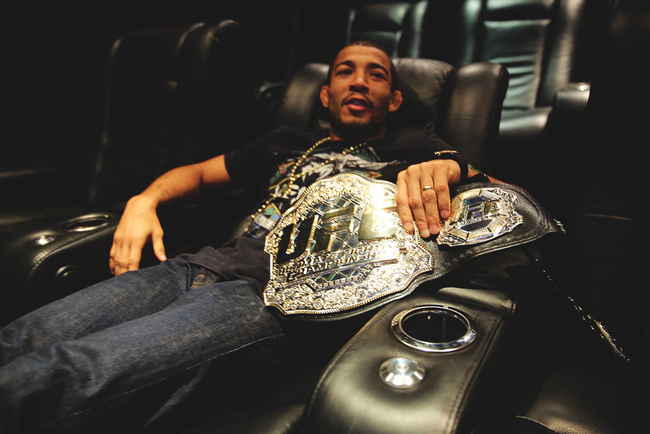 Jose Aldo: Everyone in Manaus is very, very excited. The streets are all covered in colors. You see, there wasn’t that much resistance in Manaus, it was calmer—we’re so far from everything, isolated, and this is all brand new to us, to the people there. Now we’re in the spotlight, so, it doesn't matter to them how much was spent on building the arena. People are pumped! [Manaus] is happy to be hosting the Cup. I’ve spoken with a lot of people there, even the Governor is excited. The whole city is adorned and prepared for the games. Do you think this is a good thing for Manaus? This is good for Brazil, I think. Now, Rio and Sao Paulo, the Southeast—brother, everyone’s protesting, but having the Cup here on our soil… it’s also good for Brazil because it puts the country in the spotlight. All eyes are on us, so it gives the people a chance to show their best colors, to have the world listen to them—and this is excellent. Flamengo. Everyone in Manaus is either Flamenguista or Vascaíno. Will Brazil win the Cup? Who do you think will be in the final? Definitely! I think we’ll have a final between Brazil and Argentina. It’ll be beautiful. What will happen if Brazil loses in the final? What will the national reaction be? Bro, then, Dilma [Roussef] will be the first to fall. It’ll be total chaos, a general strike. People are already clashing on the streets, if we lose…you double that…there could be war. It’ll be sinister. But I don’t [even want to think about that]… Brazil will be champion. In Brazil, what is the relationship between Soccer and Fighting? What significance do the sports hold? Every child in Brazil dreams of becoming a soccer star, it’s ingrained in the culture of the Brazilian people. There’s a passion for the sport. Nowadays, though, thank God, you can find kids who want to be fighters. The Brazilian people are a strong people, we’re warriors, and we’re always trying to make MMA more popular, it’s our second most popular sport—but soccer, that’s in our blood. What was it like growing up in host city Manaus? Man my best memories always were the same—playing soccer in the street, always having that dream. It was like that, how all young Brazilians live. You were a soccer player as a young man in Manaus. How did you get into fighting? As a kid I fought a lot. During soccer games, we’d lose—I couldn’t take that. I was a poor loser, so I’d take it out in a fight. There’d always be a fight. So I guess I was predisposed. It’s part of it. Who is your all-time favorite soccer star, current or past? I love Zico. He was the best. But my favorite player now is Messi. He’s the best in the world. Neymar—that’s just the beginning. He’s still young, but he can be an idol one day. After Flamengo, what’s your favorite team in the world? Chelsea. I love Chelsea. I’ve been there. I’m friends with a lot of the players there: David Luiz, Ramires, Oscar, Willian—I’ ve been to their matches at Stamford Bridge, and they always send messages wishing me luck before a fight, so we have that exchange. David and I are very close, we went to the Confederations Cup together, saw our friends. We have a good group. Tell us more about the Manaus arena. Of all the arenas I saw, the most beautiful one is the one in Manaus. It’s great, there’ve been matches already, I’ve been there, I’ve kicked a ball around in there. It’s gorgeous. One of the most beautiful I’ve seen. It doesn’t really matter if they’ll use it after the cup, but right now, it’s awesome. I put up some photos on my social networks of all the great things going on in Manaus. Everyone is happy, everyone is so proud to be hosting the Cup, so I don’t know why anyone would think that we aren’t. I went to the inaugural game, and it was packed. Everyone was so happy.